पीएम मोदीजी की खराब होती हवा और राहुल का चढ़ता सियासी पारा देख कई मौसम विज्ञानी पलटी मारने को तैयार होते दिख रहे हैं. इसी क्रम में ‘जी न्यूज’ ने भी सक्रियता दिखाई है. भाजपा और मोदी की भरपूर भक्ति दिखाने और कांग्रेस समेत सारे गैर-भाजपा पार्टियों को जमकर गरियाने वाले जी न्यूज को अब लगता है कि वक्त बदलने-पलटने का आ गया है. इसीलिए एक चिट्ठी राहुल गांधी के लिए रवाना कर दिया गया है कि वे जी न्यूज से पाबंदी खत्म करें और कांग्रेस के प्रवक्ता को डिबेट में बोलने-बिठाने के लिए भेजा करें. 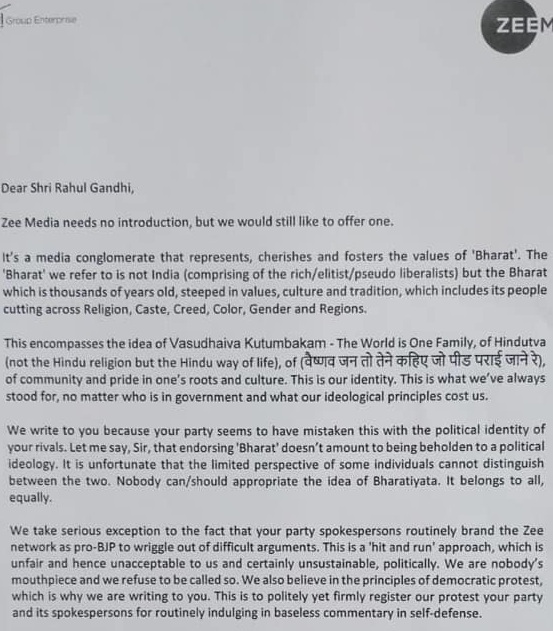 Aadesh Rawal : Zee Group writes to Congress president @RahulGandhi asking him to end the ban of Zeenews and requests him to send parties spokesperson to Zee Network debates. Network claims that, they are not the mouthpiece of any political Party or Government. दुनिया मोदी की भक्त है आप राहुल के.. कांग्रेस चाटुकारो के लिए प्रसिद्ध है..
राहुल जैसे बेवकूफ नेता को आप का समर्थन आपके दिमागी दिवालियापन का सबूत है.. I read the letter. 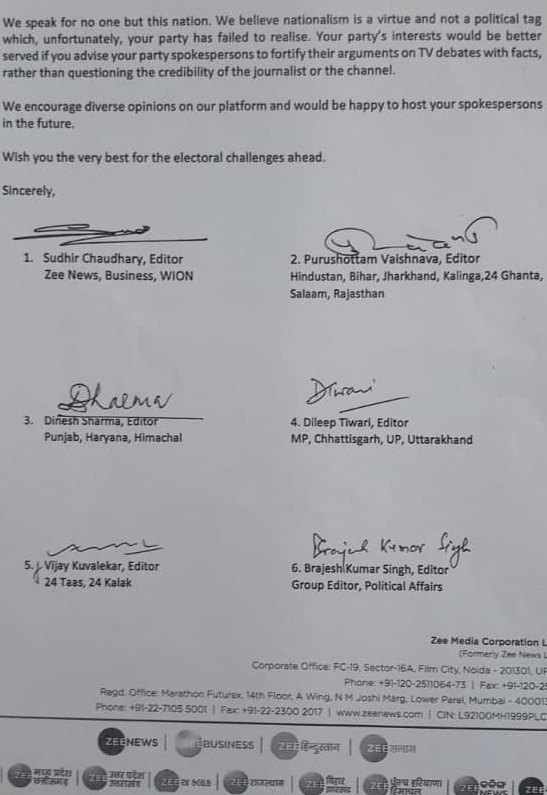 The letter to Congress President by Zee Group editors has not been comprehended well by you. It no where leans towards congress and again it’s probably your personal prejudice that it is being interpreted that Zee group is leaning towards congress( again with so called assumption of Congress Party gaining high grounds). In fact, Zee group has, very assertively, made it clear that it believes in Hindutva, Bhartiyata with samagrata, and that is not leaning towards party A or party B. It has also registered its protest towards approach of congress spokesperson, pulled congress and in a ‘politically correct’ politeness, ‘insisted’ that congress party’s spokespersons should resist making adverse comments about anchors and rather sit in debate..
Hope you would carry this observation as well in Bhadas4media. Again, these are my personal observation, without any leaning towards any party or my own organisation..